If you are visiting our website, it is likely that you have been affected by a serious and unfortunate event. Perhaps you or a loved one was severely injured in a car accident, or on another person’s property due to their negligence. Please know that we are sincerely sorry this has happened to you. Although representing those affected by tragedy is part of our day-to-day lives, we never lose sight of just how difficult such an event can be for an individual and his or her family. 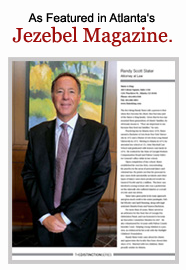 With over four decades of combined legal experience, the lawyers at Randy Scott Slater, P.C. have helped thousands of Georgians obtain a positive outcome in their legal matter. We are recognized as skilled and committed advocates by insurance companies, other attorneys, judges, and the clients who trust us with their cases. Our practice includes effective representation and a proven track record of successful results in Atlanta auto accidents, premises liability (injuries on dangerous properties), wrongful death, workers’ compensation and medical malpractice cases. If you or a loved one is in need of quality legal representation, call our office today at (404) 888-0500. We represent clients across the state of Georgia, including the cities of Atlanta, Decatur, Douglasville, Jonesboro, and Marietta. Each prospective Randy Scott Slater, P.C. client receives a free, no-obligation consultation to determine the best course of action to take in their injury case. And all information is kept strictly confidential.